pasta | Blog, Jane! Blog! I modified only slightly to also add some sun-dried tomatoes that I had in my refrigerator. Plus I also doubled this and froze half for my friend Sara. In a large pot over high heat, boil water and prepare pasta shells as directed on package. Cook pasta shells only until al dente. The pasta will finish cooking when the dish is baked. Drain the pasta shells and set aside. In a large bowl, combine the rest of the ingredients, except the 1/4 cup of cheese for the topping. 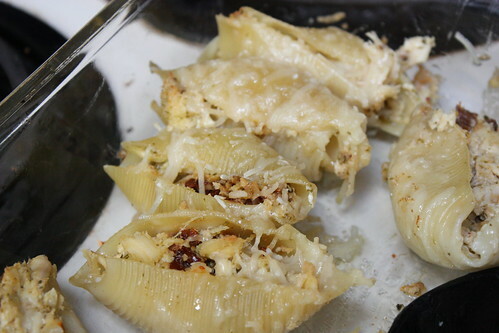 Fill the pasta shells with the filling and place in a 9×9 (or 8×8) baking dish. Sprinkle the remaining 1/4 cup of cheese over filled shells. Preheat oven to 350 degrees and bake shells uncovered for 30 minutes or until shells are bubbling hot and cheese melts. The leftovers- Maria loved this. So kid-tested, mother-approved! * To make ahead/freezer meals – Prepare as directed but place filled shells in an oven- and freezer-proof baking dish. Top with remaining 1/4 cup of cheese over filled shells, cover and freeze. When ready to prepare, defrost. Preheat oven to 350 degrees and bake shells uncovered for 35-40 minutes or until shells are bubbling hot and cheese melts. Boil the macaroni in a 2 quart saucepan in plenty of water until just tender, about 7 minutes. Drain. In a medium saucepan, mix butter and cheese. Stir until the cheese melts. In a slow cooker, combine cheese/butter mixture and add the eggs, sour cream, soup, salt, milk, mustard and pepper and stir well. Then add drained macaroni and stir again. Set the slow cooker on low setting and cook for 3 hours, stirring occasionally. I love a good pasta salad, but until last week I had never found my own recipe that I liked. I started with this recipe found at allrecipes.com. I really liked the dressing but tweaked the makings of the actual salad a little. And the recipe typed below is actually half of what I made, because it was a LOT of pasta salad! 1. In a large pot of salted boiling water, cook pasta until al dente, adding carrots for last minute of cooking, rinse under cold water and drain. 2. In a large bowl, combine the all ingredients. Allow to chill overnight. In the morning, if you would prefer more dressing add more dressing. If you are running low on dressing, add a bit of olive oil and more Italian Seasoning. I made this recipe last week. We all though it was delicious, but especially Maria! And it reheated really well too! Very easy to put together too!! Probably easier than cooking ravioli and sauce separately. The store only had one bag of cheese ravioli, so I made it with one bag of cheese and one bag of chicken ravioli. 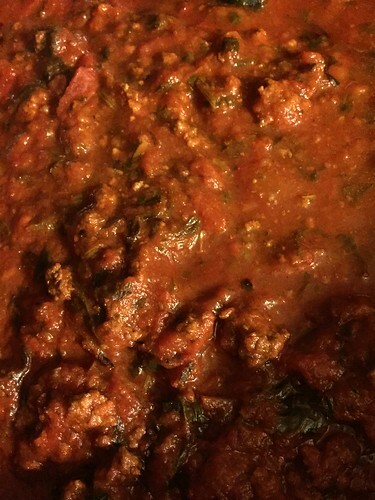 MIX spaghetti sauce, tomatoes and water; spoon 1 cup onto bottom of 13×9-inch baking dish. LAYER half the ravioli and 1 cup shredded cheese over sauce. Top with remaining ravioli and sauce mixture. Sprinkle with remaining shredded cheese; cover. BAKE 30 min. ; uncover. Bake 15 min. or until ravioli is tender and heated through. Sprinkle with Parmesan. Let stand 10 min. AND… it was good. Not sure I’d make it on a regular basis, because I honestly have a hard time buying Velveeta! The only thing I did differently was also add some mustard.. (I figured it already had cheese, hamburger and ketchup!) And it was easy, and was a one-pot meal! LOVE that! ADD water, ketchup and onion powder; mix well. Bring to boil. Stir in macaroni; cover. Simmer on medium-low heat 8 to 10 min. or until macaroni is tender. STIR in VELVEETA; cook until melted, stirring occasionally. *Maybe it’s the word pasteurized that really turns me off??? Football season happens to coincide with the start of crockpot season! Oh how I love cooking with my crockpot. I found this recipe in the Kraft Foods Food & Family magazine. Very easy take on lasagna. Not a weekday recipe, as it only cooks for 4-6 hours (on low), but works well for weekends, especially football Sundays! It was good and it definitely made enough for a full meal of leftovers (for both of us). I did substitute cottage cheese for the ricotta and dried parsley for fresh. BROWN meat in large skillet; drain. Stir in spaghetti sauce and water. Mix cottage cheese (or ricotta), 1-1/2 cups mozzarella, 2 Tbsp. Parmesan, egg and parsley. SPOON 1 cup meat sauce into slow cooker; top with layers of half each of the noodles, broken to fit; and cheese mixture. Cover with 2 cups meat sauce. Top with remaining noodles, broken to fit; cheese mixture and meat sauce. Cover with lid.